It was a Saturday morning in early March, and I was helping to run a photo shoot at an Italian restaurant in Burbank. A photo shoot for a play series I was co-producing – a series of film noir-themed one-acts. I had just returned to Los Angeles after spending ten days in the Pacific Northwest on important family business, ten days that culminated in a freezing, cold, bleak weekend in Medford, Oregon, during which we buried my dad. One of the members of our ensemble made a comment, almost off-handedly, about the fact that bad luck seemed to follow me around when I produced this show. ‘Maybe you should stop doing it,’ he said. I flinched, shrugged it off, and kept going. But in truth, he had a valid point. 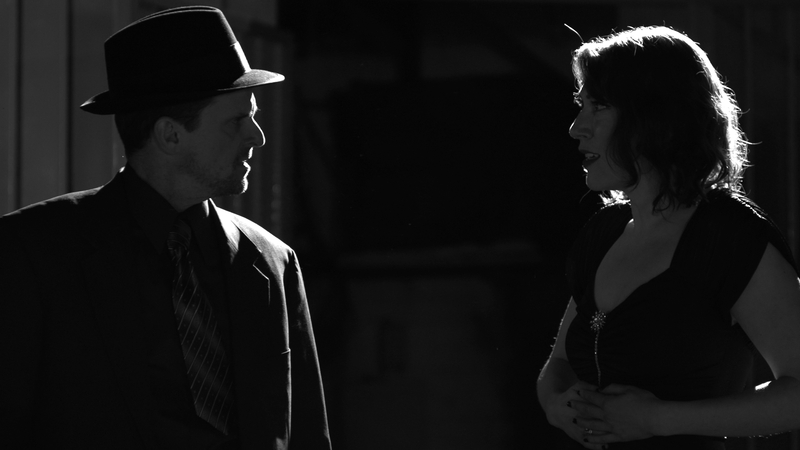 We were now in the second year of the noir play series, and ever since I’d been working on it, ever since my co-producer – my husband James – and I had developed the concept, bad things had been following me around. In the weeks leading up to year one’s production, our beloved dog succumbed to cancer, and just a few days later, my dad was also diagnosed with the big C, his prognosis terminal. After dad’s diagnosis, my mother – I think, in a desperate attempt to feel better – booked a trip to L.A. to see the show, took one look at me and promptly fell apart. And when I say fell apart that is a grand understatement. She unraveled before my eyes. She went into an emotional tailspin during which she spent a week holed up in her hotel, too sick to travel, visited frequently by the hotel doctor. I passed the week on high alert, fielding her frantic phone calls, until, finally, she ended up in the emergency room. I kept vigil the entire day, helpless, watching the heart rate monitor as her pulse raced at frightening speed, as she maxed out on anti-nausea meds and still couldn’t stop vomiting, as the doctors were unable to diagnose her with anything other than severe anxiety. They sent her home with a whole slew of Ativan, and the next day she was back in Olympia. The show went on, though my mom never got to see it. And three months later she was dead. Fast forward to year two of the noir play series, to the aforementioned photo shoot, to March of 2013. My father had just died, succumbing to pancreatic and liver cancer roughly nine months after his stage four diagnosis. Shortly before my mother’s death, my grandmother (my mom’s mom) was diagnosed with Alzheimer’s disease and the shock of my mom’s passing caused her to spiral suddenly and rapidly. She erupted in rage fits and it was no longer safe for her to live at home, so my uncle placed her in a full time care facility. When I visited her the week after my dad died, she barely knew me, though just three months earlier we’d talked on the phone nearly every day, mostly about my mom, about how sad she was, about how she didn’t understand what had happened. Now here she was in a wheelchair, with pink painted fingernails and childish plastic barrettes in her hair, a vacant look in her eyes. And the show went on. In the space in between my parents’ deaths, in the months where I rarely slept through the night, during the days that every time a number with a 206 or a 360 area code appeared on my cell phone and my heart momentarily arrested (Dad? Are you OK? ), I found a play that I fell in love with. It was called Speak No Evil, written by a Chicago-area playwright named Michael Moon, whose work we’d produced in the first year of the series. He had such a fantastic grasp of the noir genre, such a beautiful, lyrical way of writing, I emailed him and asked if he had anything else. And Speak No Evil arrived, a simple, compelling story about a mute street vendor who witnesses a murder, and enlists the help of a down and out private detective to clear his name. I didn’t care what other stories we produced, I wanted Speak to be the centerpiece of the noir festival. In fact, the play touched me so much that it inspired an even greater ambition: to produce it as a film. And so time went on, filled up with acting rehearsals and directing rehearsals and production duties. It went and went and went and suddenly we were at tech weekend, the weekend that all theatre geeks know as ‘hell,’ because of the long hours in the theatre working out all the stuff that’s less than fun like lighting cues and music cues and scene changes and, well, tech. It was on a Saturday morning in mid-April, the very beginning of tech weekend, that I got the call. My grandfather’s voice on the other line, distant, strained, final, telling me that my grandmother had died. I had known it was coming – she’d been in hospice for weeks – but I didn’t know it would come quite so soon. I didn’t know it would come then. There would be no funeral, just a summer barbecue to celebrate her life, when the weather was better. So I took the call, and I went to the theatre. And I told no one. Not my friends, not my half-siblings who’d already been through hell with me over our dad. Not even my husband. I kept it to myself and went on with the show. That seems crazy to me now that I did that; that I kept something like that from everyone. But the truth is, I was just tired. Tired of all the tragedy, exhausted from talking about it, tired of re-living the same sad events over and over, of having to manage the reactions and emotions of other people when I told them, tired of the ‘I’m sorry, I have no idea what to say’ look, or worse, the ‘there must be something wrong with you’ look, the look that caused a fellow actor to note that bad things kept happening to me while producing a show revolving around noir – a genre that literally means black – as though I had somehow invited this dark storm cloud to visit me and hang over my head, as though I had unwittingly cursed myself. As though this were all my fault. I can see now that I kept myself busy to avoid feeling like the world was collapsing around me. I can see now that finding quiet, dark backstage corners to stifle sobs before they became uncontrollable and then going back to work wasn’t normal or healthy. But all I wanted was to do what I loved, to immerse myself in storytelling, to be creative, to find my heart again. All I wanted was to feel normal again. All I wanted was my life back. So I became an expert. An expert at work, an expert at holding it all together, an expert at being everything for everyone. In a little over a year, I co-produced nine one-act plays, and took on the biggest creative endeavor of my life, Speak No Evil, the movie. While I can admit that the work was an attempt to manage my grief, I remain incredibly proud of the things I accomplished during that horrific year. But I can also see that I took it too far. That, in holding it all together, I covered up uncomfortable truths. I took care of far too many things – and people – that I had no business taking care of. And I never took care of me. This week, thanks to the generosity of a friend, I’ve been passing my days alone in a beautiful home by the sea. A place where I can spend the week writing and reading and taking long walks and lying in bed with the windows open and the ocean waves lulling me to sleep. A place that’s safe and quiet and serene. I know a week isn’t enough time to process and heal from everything I’ve been running from, but it’s a start. Slowing down does not come naturally for me, but life has taught me that sometimes, you have to submit. To give up, and give in. And to have faith that when all the falling apart is over, I’ll be able to piece myself back together – stronger, better – and begin again. I pray these things for you. This is so lovely, Michael. Thank you for your beautiful words, your kind wishes, your heartfelt prayers. They mean more to me than I can say.